Be here tonight for the penultimate round of the GEF-Gaming GT3 Masters. This time around we’re going for the Azure Circuit, riding the guardrails. Give that pit crew a workout. 😉 Server will be open shortly past 1900, as always. Today we’ll go racing on the undulating strip of tarmac of Sakitto GP. Agreed, it’s not Suzuka but still a highly enjoyable track with lots of fast corners. 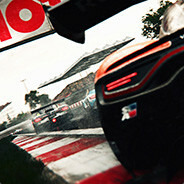 So, be there tonight for round 11 of the GEF-Gaming GT Masters #2.